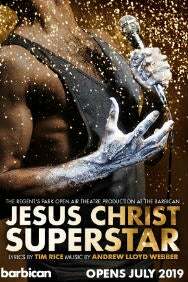 The multi award-winning production of Tim Rice and Andrew Lloyd Webber's Jesus Christ Superstar& is back. Playing just 60 performances at the Barbican following two sell-out seasons at Regent's Park Open Air Theatre, this "gorgeous, thrilling, heavenly musical" (Guardian) is "an almighty revelation" (Daily Telegraph). Jesus Christ Superstar &previously played two sell-out seasons at the Open Air Theatre before transferring to the Lyric Opera of Chicago in 2018. It will embark on a North American tour from October. The new cast of Jesus Christ Superstar& includes Robert Tripolino and Ricardo Afonso in the iconic roles of Jesus and Judas, with Sallay Garnett as Mary. Matt Cardle plays the role of Pilate, with Cavin Cornwall and Nathan Amzi as Caiaphas and Annas. Please note that Matt Cardle will not appear on Saturday 13 July (evening), Tuesday 30 July, Wednesday 31 July or Saturday 3 August (evening). Certainly the best show so far this year. (10mins) Take Goswell Road and turn right at Fann Street. Continue straight onto Fortune Street, before turning right at Whitecross Street and follow it all the way down to the theatre entrance.